Elijah challenges the prophets of Baal to show whether or not their god is able to hear and answer. 19. Now therefore send, and gather to me all Israel unto mount Carmel, and the prophets of Baal four hundred and fifty, and the prophets of the groves four hundred, which eat at Jezebel's table. 20. So Ahab sent unto all the children of Israel, and gathered the prophets together unto mount Carmel. 24. And call ye on the name of your gods, and I will call on the name of the Lord: and the God that answereth by fire, let him be God. And all the people answered and said, It is well spoken. 25. And Elijah said unto the prophets of Baal, Choose you one bullock for yourselves, and dress it first; for ye are many; and call on the name of your gods, but put no fire under. 26. And they took the bullock which was given them, and they dressed it, and called on the name of Baal from morning even until noon, saying, O Baal, hear us. But there was no voice, nor any that answered. And they leaped upon the altar which was made. Elijah mocks the prophets of baal about their god being too busy to hear their cries. 27. And it came to pass at noon, that Elijah mocked them, and said, Cry aloud: for he is a god; either he is talking, or he is pursuing, or he is in a journey, or peradventure he sleepeth, and must be awaked. 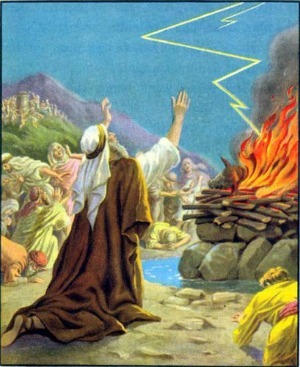 Elijah then shows the people and the prophets of baal the power of the one true God. 34. And he said, Do it the second time. And they did it the second time. And he said, Do it the third time. And they did it the third time. 38. Then the fire of the Lord fell, and consumed the burnt sacrifice, and the wood, and the stones, and the dust, and licked up the water that was in the trench. 39. And when all the people saw it, they fell on their faces: and they said, The Lord, he is the God; the Lord, he is the God. 40. And Elijah said unto them, Take the prophets of Baal; let not one of them escape. And they took them: and Elijah brought them down to the brook Kishon, and slew them there.